PATEK PHILIPPE REF. 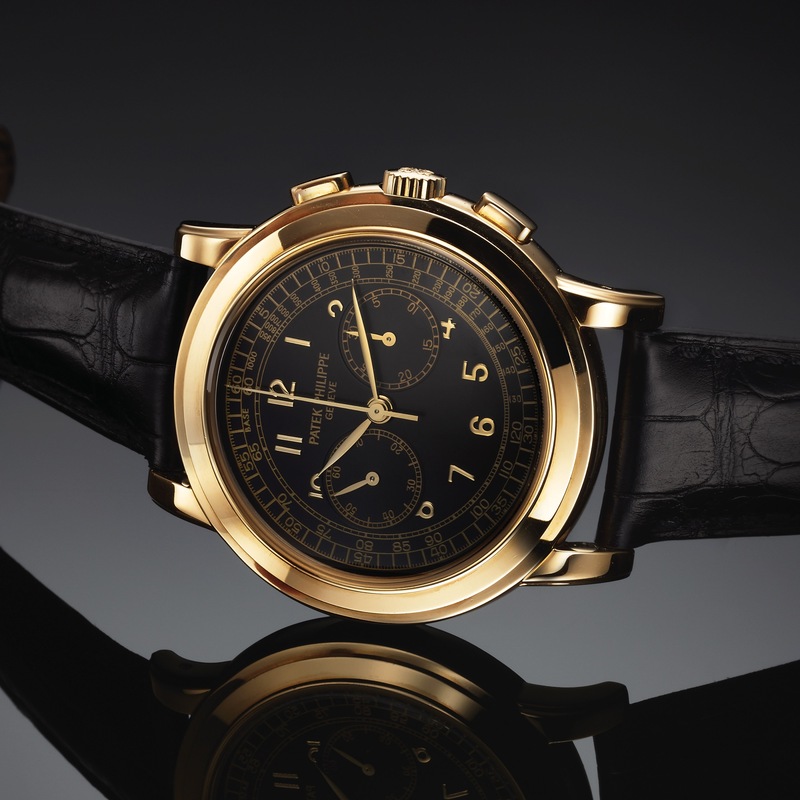 5070 CHRONOGRAPH YELLOW GOLD Patek Philippe, Genève, movement No. 3146534, Ref. 5070 J. Made in 1999. Very fine, large, 18K yellow gold wristwatch with square button chronograph, register, tachometer and an 18K yellow gold Patek Philippe deployant clasp. Two-body, solid, polished, transparent screwed down case back, stepped bezel and lugs, sapphire crystals Black with applied yellow gold Arabic numerals, subsidiary dials for the seconds and 30-minute register, outer 1/5th seconds track with 5-minute/seconds Arabic markers and tachometer graduation. Yellow gold feuille hands. Cal. 27-70 CHR, stamped with the Seal of Geneva quality mark, rhodium- plated, fausses cotes decoration, 24 jewels, straight line lever escapement, Gyromax balance adjusted to heat, cold, isochronism and 5 positions, shock absorber, self-compensating free-sprung Breguet balance spring. D. Black with applied yellow gold Arabic numerals, subsidiary dials for the seconds and 30-minute register, outer 1/5th seconds track with 5-minute/seconds Arabic markers and tachometer graduation. Yellow gold feuille hands. M. Cal. 27-70 CHR, stamped with the Seal of Geneva quality mark, rhodium- plated, fausses cotes decoration, 24 jewels, straight line lever escapement, Gyromax balance adjusted to heat, cold, isochronism and 5 positions, shock absorber, self-compensating free-sprung Breguet balance spring. Dial, case and movement signed. DIAM. 42 mm. THICKNESS 12 mm.